ZOOM Family Film Festival. Photo. Wexner Center for the Arts, The Ohio State University. <http://wexarts.org/film-video/zoom-family-film-festival-0&gt;. Join ZOOM for its annual Family Film Festival this Thursday through Sunday, December 5th through the 8th! Celebrating a decade of affordable and age-friendly film screenings, this season promises adventure, creativity, and play for parents and children alike. Thursday, experience the comedy of silent shorts and cartoons such as Charlie Chaplin in The Immigrant and Buster Keaton in The Love Nest while marveling magic trick films by Georges Melies. Friday, arrive for an evening with Adam Pesapane to learn of his creative process and view a handful of his innovative short films and nominated commercials. Perry, Blair. ZOOM Family Film Festival. Photo. Wexner Center for the Arts, The Ohio State University. 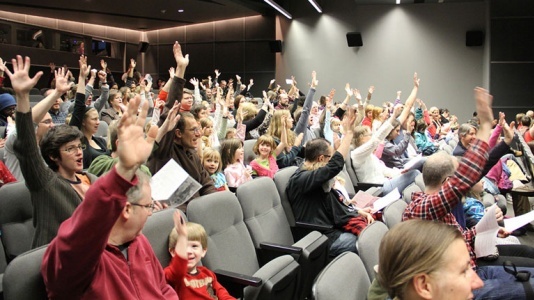 <http://wexarts.org/film-video/zoom-family-film-festival-0&gt;. Don’t bother to change out of your pajamas Saturday. Adorn yourself in the lively animation of cartoons while munching on free cereal from the Wexner Center café for the Kids Flix Mix. Spend the day to divulge in additional treats, such as the celebrated Japanese animation A Letter to Momo, an array of International Shorts from Seattle’s Northwest Film Forum, best selections from New York’s International Children’s Film Festival, and the visually stunning watercolor style of the film Ernest & Celestine. Free Jeni’s Splendid ice cream will be served during the ice cream social in the Mershon Auditorium Lobby to enhance the sweetness of Saturday’s already rich film sensations. Mondo, one of ZOOM’s most memorable films will be shown Sunday, a last hoorah for the festival’s 10 year celebration. In French with English subtitles, the film will leave you to part with an awakened sense of wonder, evocative of the adventurous and playful spirit of ZOOM itself. Tickets are $3 for members and $4 for the general public. Visit http://wexarts.org/ for more information or to purchase tickets, call (614) 292-3535. Blues for Smoke exhibition admission is free with any same day film ticket. An event of incredibly affordable price, it is truly an experience you won’t want to miss!